Are women "weaker vessels" than men? There are two bottles of juice in your refrigerator. One was recently purchased from the grocery store; the other has expired by several months and remained in the refrigerator unnoticed due to other items blocking it from view. All the common dishes are currently in the dishwasher washing, so you are forced to use the delicate "special occasion" glasses stored on the top shelf of your kitchen cabinets to have a glass of juice. The first glass you pour is from the newly purchased bottle of juice. You carefully pour the juice into the glass handling it with care, you also slowly set it down on the table as you recline and consume the flavorful beverage. It was so refreshing that you went back to the refrigerator for another glass. This time you accidently used the expired juice to pour a glass to drink. With the same caution as last time you sit down at the table ready to have another refreshing glass. You pick up the delicate vessel of juice, you take a large gulp.... Uuuggghh! The taste is so sour and rotten that you slam the glass down on the table in utter disgust! Crash! The glass explodes into thousands of pieces all over the table and floor! You are left with a terrible mess to clean up, and a terrible taste in your mouth. You think, what on Earth happened? 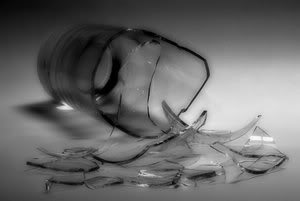 I cannot believe that I just broke such a valuable glass! In this story the value and nature of the special occasion glass was properly considered at first. You had a refreshing glass of juice while handling the unique glass with utmost care. But this was not the case with the second glass... As soon as the putrid taste of the expired juice entered your mouth all remembrance of the vessel's value left your mind and immediately you treated the object with disregard and lack of respect for it's worth. This is how many husbands like me make mistakes in our marriage, at certain times we fail to embrace the value and nature of our wives due to sour circustances or having a rotten day, and when this happens we are left with a huge mess and a terrible taste in our mouths. In this blog I want to focus on the passage about husbands in 1 Peter 3:7. I will endeavor to break apart the many nuggets of wisdom it contains while showing how it practically applies to each of us today. 1 Peter 3:7(ISV)-"In a similar way, you husbands must live with your wives in an understanding manner, as with a most delicate partner. Honor them as heirs with you of the gracious gift of life, so that nothing may interfere with your prayers." There are a couple of key phrases that Peter writes in this verse that I want to point out before going any further. The first phrase I want to look at is "live with your wives in an understanding manner." This was translated from a Greek phrase "live (with your wives) in wedlock by way of knowledge." So the question would be, knowledge of what? Peter explains this as having knowledge that your wife is a "most delicate partner." The other phrase I want to look at is "honor them as heirs with you of the gracious gift of life." This translates from a Greek phrase "apportioning due value as also a co-inheritor of the grace of life." So to "honor" your wife is to "apportion due value" to your wife. So what is her due value? This is gauged in light of the fact that she is a co-inheritor with you of the grace of life. That is, God looks at her as so valuable that He gave His only begotten Son to save her, and we need to look at her with the same level of value as her husband. So in 1 Peter 3:7 we see that God wants to answer our prayers as husbands. But He explicitly states that our prayers may be hindered if we are not careful. God teaches us that He wants us to value our wives like He values them, by demonstrating great care with her as a delicate partner. When we do this our prayers are more effective because we have our priorities in order. So this takes us back to the special occasion glass analogy. When our wives are in a good mood and "doing all the right things,"we have a much easier time treating her with great worth and care. But when we are on the outs with our wives, or stressed out over things in life, or whatever other issue it may be, it becomes easy to act carelessly in the way that we speak or act toward her. This is when we cause great pain for our wives and have a huge mess to clean up. We must remember that she is fragile and delicate even when we are experiencing a moment of conflict or stress. Now, is our motivation for treating our wives with care as a delicate partner for the sole purpose of having our prayers answered? Absolutely not. As a matter of fact we are supposed to treat our wives with care based upon the fact that we have properly appraised her value, we love her and see her with the eyes that God sees her. When we see her as a valuable child of God and let that reality flow into our actions, we begin to treat our wives the right way, with love, kindness and grace. But when we forget this reality it won't be long until we damage her and find ourselves in a mess all over again, just like the costly glass that was shattered in the story. This usually happens when our judgment is clouded by emotions and stress. Think about it this way. What if God sent you a valuable item today? Suppose a truck shows up at your house to deliver the portrait of Mona Lisa for you to own from now on. Think of the great care that you would exhibit toward such an expensive piece of history. You would most likely take meticulous daily precautions to make sure the item was always in good condition. What if we start looking at our wives in this manner? As a priceless gift from God that He has entrusted into our care, a gift that we strive to keep from being damaged, that we endeavor to treat with gentleness at all times. I believe this is the point that Peter was trying to make in 1 Peter 3:7. And the reality is, if you are married God has given you so much more than a priceless material item such as the portrait of Mona Lisa, He has given you a precious co-heir to the gift of life that Jesus died to give us all! My prayer is that God will help us men to view our wives the way that He does, and use wisdom in the way that we engage with them every day. As we acknowledge our wives as delicate partners who are worth far more than anything else in the world I believe God will start the process of making us into the great husbands we are called to be. I pray that God will help us to not be clouded in our sight by emotions when we are stressed or experiencing conflict, but to continue to keep the great worth of our wives in perspective by showing kindness and grace in abundance. This will help us to nurture our wives into the beautiful flower that they are. And most of all it will please God when we lavish His love upon them through our relationship with Him. God bless and I hope you enjoyed this blog! Please share so that other husbands can be impacted by 1 Peter 3:7! A few months ago myself and three other pastors from my church were meeting to decide on the wording for a brief statement of faith that we wanted to start reciting at the beginning of our Sunday morning services. At one point I suggested that we use the word "justification" in one of the sentences, another pastor quickly looked at me and said, "do you know how many people don't even know what that word means?" What he said caught me by surprise, but as I thought about it I began to realize that he was probably right. This dilemma began to roll around in my thoughts for the next couple months until I finally decided that I needed to write this blog. So here it is, I am going to take some time to explain what justification is, it's repercussions, and why it is so crucial to understand as believers. Justification is the declaring of a person to be just or righteous. It is a legal term signifying acquittal (Baker's Evangelical Dictionary of Biblical Theology). That is, we are made to be righteous apart from, and in spite of our sins that earn us guilt. This word has a legal connotation implying that a certain penalty is not owed to an individual based upon their standing with the court. 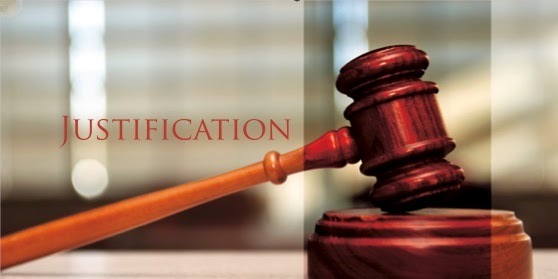 I'm sure after hearing these definitions you can begin to see why the word justification it is so central to the Gospel of Jesus Christ, but I will explain in detail all of it's repercussions later in this blog. Right now I want to take some time to focus on a pivotal text from scripture regarding this doctrine of justification. Romans 5:1-2- "Therefore, since we have been justified through faith, we have peace with God through our Lord Jesus Christ, through whom we have gained access by faith into this grace in which we now stand. And we boast in the hope of the glory of God." This passage gives us a basis for understanding how powerful justification really is when it comes to our salvation. Justification is so powerful that it gives us total peace with God. Justification nullifies the vicious cycle of striving to maintain a right standing with God. It puts to death our trust in us, it forces us to trust in the work that Christ did at the cross on our behalf. And this is exactly where God wants us to be, fully trusting Him for everything we need, especially our salvation. Justification gives us confidence that we now have total access to God the Father, we need not meet a list of conditions to enter His presence. Our faith in Christ has made us righteous in God's sight. Justification also serves as the only basis for a true and steady hope in eternal life. Now, I mentioned that we need not meet a list of conditions to enter God's presence. One might say, "well doesn't the Bible say we need to confess our sins and repent when we make a mistake in order to get right with God again? Doesn't that serve as a condition?" That's a very good question. When a believer sins it doesn't cause them to break relationship with God. That is, we do not lose our position as a child of God. So no there aren't any conditions we need to meet to remain God's child. However, we do prohibit intimate fellowship with God when we sin. This is because when we sin it isn't just against us or somebody else, it's directly against God our Creator. Psalm 51:4-"Against you, you only, have I sinned and done what is evil in your sight; so you are right in your verdict and justified when you judge." In the same way that we offend another person when we do something aganist them, we offend God our Creator when we sin against Him, and thus our intimate fellowship is cut short until we ask God to forgive us. So the answer is no, confessing our sin is not a conditon we need to meet in order to maintain relationship with God, but it is a "condition" we need to meet in order to maintain intimacy with God. We wouldn't even be able to go to God and confess our sin if justification through Christ did not open the door for us to do so. Without the binding legal ramifications of justification, we have absolutely no basis to hope in eternal life. This means we have no basis to be comforted when a believer we know dies, we have no basis to thank God for saving us, no basis to rejoice in the reality of His gift of eternal life, and no basis to not be horrifically afraid of dying. Why is all of this so? Because if there is any inkling of a possibility that we have to maintain a list of unattainable standards in order to continue to be justified in God's sight, we can have no certainty as to whether or not we will actually finish the race without error, and we can't be certain that others have finished the race without error either. Justification removes this uncertainty by addressing every aspect of our sin, past, present, and future, and giving a legal declaration of not guilty through faith in Jesus Christ. This is why when Paul writes about our justification in Romans chapter 5 he follows it with, "And we boast in the hope of the glory of God." This means that because we have been declared righteous by God we can now have certainty of eternal life. This gives us plenty of reasons to rejoice! It's the foundation of our joy in Christ! Justification is God's legal, binding, and irrevocable guarantee that we are going to spend eternity in His Kingdom. While we are on the subject of justification by faith I want to take a moment to address the idea of "saving faith" versus "fleeting belief." A person cannot be justified in God's sight by merely having an emotional moment that amounts to nothing more than mental assent. I believe that thousands of people walk down the aisle each year hyped up over emotions, and they pray the sinners prayer thinking it's "the thing you have to do to get to Heaven." Many of these people do not experience saving faith, although some certainly do, but saving faith occurs when God grabs hold of you and empowers you to believe with your whole heart. With saving faith God's word penetrates a softened heart that was prepared by His Spirit beforehand, and it bears fruit afterward. In the parable of the sower we see an example of a person who demonstrates saving faith (Mat 13:23), but we also see an example of a person who demonstrates fleeting belief. "The seed falling among the thorns refers to someone who hears the word, but the worries of this life and the deceitfulness of wealth choke the word, making it unfruitful." (Mat. 13:22) We also see this in Mat. 13:20-21, and various other places in the Gospels and New Testament letters. Justification can only occur when a person demonstrates saving faith. Now, back to justification. Later on in Romans chapter 5 we find Paul explaining the process of justification by drawing a parallel between Adam and Jesus. Romans 5:18-19- "Therefore, as one trespass led to condemnation for all men, so one act of righteousness leads to justification and life for all men. For as by the one man's disobedience the many were made sinners, so by the one man's obedience the many will be made righteous. Here Paul explains that through the disobedience of Adam we all inherited a sinful nature by default, this sinful nature leads to disobedience which brings condemnation for everyone. In the same way, a person is now able to inherit a new nature which is the essence of righteousness through faith in Jesus Christ, this leads to justification for all who believe. So the way that justification works is that God gives us the righteousness of Jesus Christ, who lived a sinless life on our behalf. As you can see God is very systematic in the way that He goes about justifying a person. On might ask, "why doesn't God just forgive everyone and save all the trouble?" The answer comes from understanding God's multifaceted nature. God is not only merciful, He is also perfectly just. This means that He cannot let sin go unpunished. Therefore, God became a man to live a sinless life on our behalf and die the death we deserved in order to satisfy the penalty that our sin called for. This is what one would expect from a perfect God who is both merciful and just, and in Christ we find God combining two seemingly opposite concepts (justice and mercy) in a most beautiful and powerful way. As a matter of fact, there are no words to describe how majestic this process of justification truly is. Only the Eternal God could accomplish the feat of rendering mercy and justice together in the same independent act, and that act was the death of Christ on the cross. The repercussions of justification by faith are unending but I want to point one final aspect of what justification does before ending this blog, the repercussion is this; justification by faith gives us power to endure trials. Romans 5:3- "Not only that, but we rejoice in our sufferings, knowing that suffering produces endurance." So in this verse Paul has just finished writing that because of justification we can "boast in the hope of the glory of God (being with God forever)," then he goes on to say that because of justification we can also rejoice in our suffering. Why is that? I believe the most concise answer is found in 2 Cor. 4:17 where Paul says, "For our light and momentary troubles are achieving for us an eternal glory that far outweighs them all." Because of justification we have a certain hope in eternal life, and because of that we are able to look at our suffering and trails with the confidence that God will reward us in eternity for each of them. Without justification we have no certainty of eternal life and therefore our trails are meaningless and we have no reason to rejoice whatsoever. But thank God that is not the case! God will wipe every tear from our faces, and He will do this because we have been justified by faith in Jesus Christ! So as you can see justification is essential is more ways that we could ever imagine! Justification is important for believers to understand for many different reasons. Without it you have no basis for hope in eternal life, you also have no reason to rejoice in suffering, you have no security in your relationship with God, you will tend view God as a taskmaster rather than a loving Father, you ultimately have no certain comfort regarding other believers who have died, you will tend to walk in condemnation and legalism, and you will never fully understand the power of what God really did through His death, burial and resurrection. I guess you could say in short that without justification by faith there is no gospel. Without justification by faith there is only religion, there is only an inadequate attempt to follow a list of rules hoping that you got it all right before you die, and none of us do. This is why justification is so important, because it is the very foundation of Biblical Christianity, it is the entire reason that Christ died! Now that we have discussed what justification is, it's repercussions, and why it's important to understand as believers, I hope that you feel more empowered than ever to pursue all that God has in store for your life. We can now relate to God in a way that is confident, thankful, secure, hopeful, and so much more! Please consider sharing this message with others so that everyone can realize that justification is the gospel's most important word! God bless!